We live in a culture that lives and breathes celebrities and oversharing. Half of the time, we’re more interested in what celebs are doing than our own lives. We love to share everything about ourselves online, and we love when other people do the same. It seems that there’s no picture or situation off limits. The celebrities in this article are sharing some of their most intimate moments after surgeries and sicknesses that are weirdly addicting to look at. In 2013, during a taping of Fashion Police, Kelly Osbourne wasn’t feeling well and ended up having a seizure. She was placed on the floor in front of the studio audience as the seizure lasted about 30 seconds. There was an EMT that happened to be in the audience and helped her out and followed some medical protocols. She awoke on the floor and was shielded by blankets on her way out of the studio so that no paparazzi could see her. She was taken to the hospital and would make a full recovery. 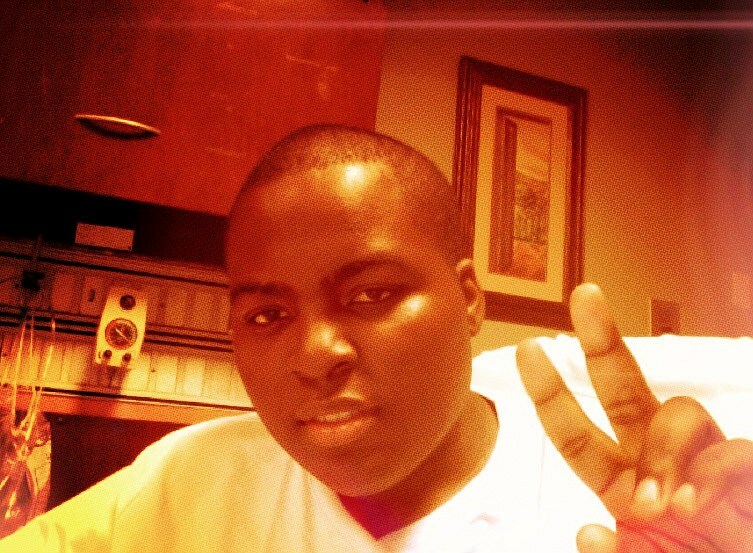 Sean Kingston was in a jet ski accident in 2011 that almost killed him. He was in Miami enjoying the water when his jet ski slammed into a bridge catapulting him and his passenger into the water. Kingston says he was knocked unconscious when he hit the bridge. He was taken to the hospital in critical condition, and after 11 days, it seemed he was getting better, but he had torn his aorta which required emergency surgery. He posted this picture to social media to let his fans know that he was on the road to recovery. Going to the emergency room at any hospital is nerve-wracking. There’s never a “good reason” to head to the ER, but singer Pink has a completely different opinion on the issue. Find out the insane reason why Nick Cannon has had multiple emergency trips to the hospital very shortly. 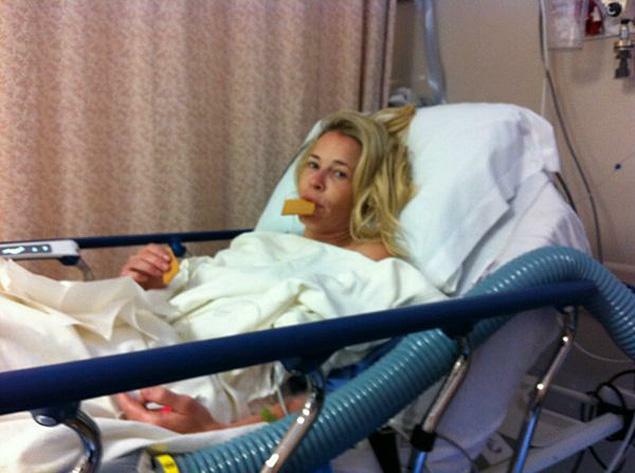 Hospitals aren’t necessarily known for their snacks, but comedian Chelsea Handler made the most out of her time after getting a major knee surgery in 2012. She posted this picture to Twitter to show that she was recovering well from her surgery and that she was thoroughly enjoying the snacks she was given. Handler has since become the darling or Netflix with multiple documentary series’ and talk shows on the streaming network. She’s killing it. We go from a picture of Chelsea Handler to one of her past lovers, 50 Cent (yes, Handler and 50 Cent dated for a while, look it up). 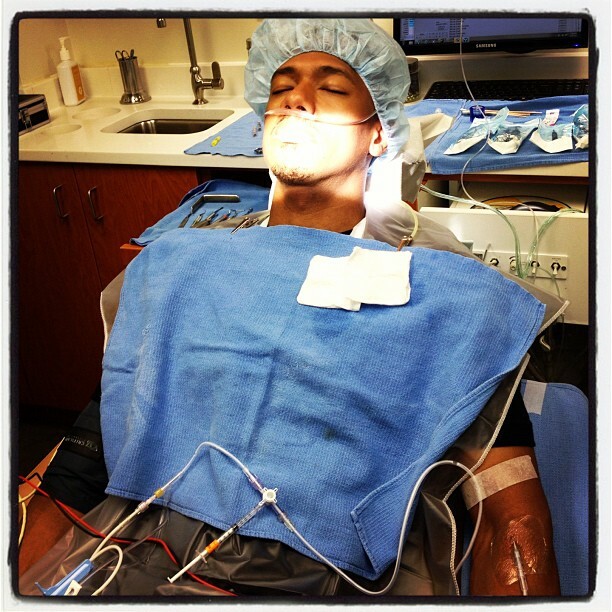 He never admitted as to why he was in the hospital, but he did post this picture, and the rumor pool swirled around. In another picture he shared about this experience, he showed all the stuffed animals that he received from his friends. Nick Cannon is one busy dude. At one point he was hosting America’s Got Talent, Wild’N’Out, and had his own radio show while continuing to do standup comedy. He’s had his run-ins with the hospital recently as he suffered kidney failure and then was taken to the hospital with life-threatening blood clots in his lungs. Soon after, it was revealed that he had a lupus-type autoimmune disease. He’s had to learn to live with the disease and manage it daily. 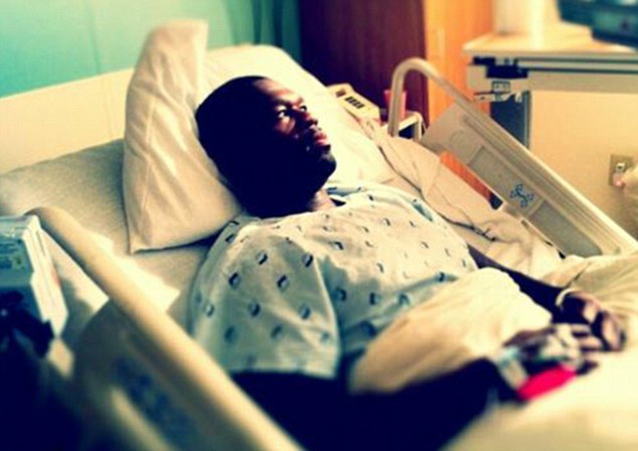 A hilarious picture of Diddy in the hospital is coming up very soon. Rihanna was rushed to the hospital after partying a little too hard at the Met Gala in New York. 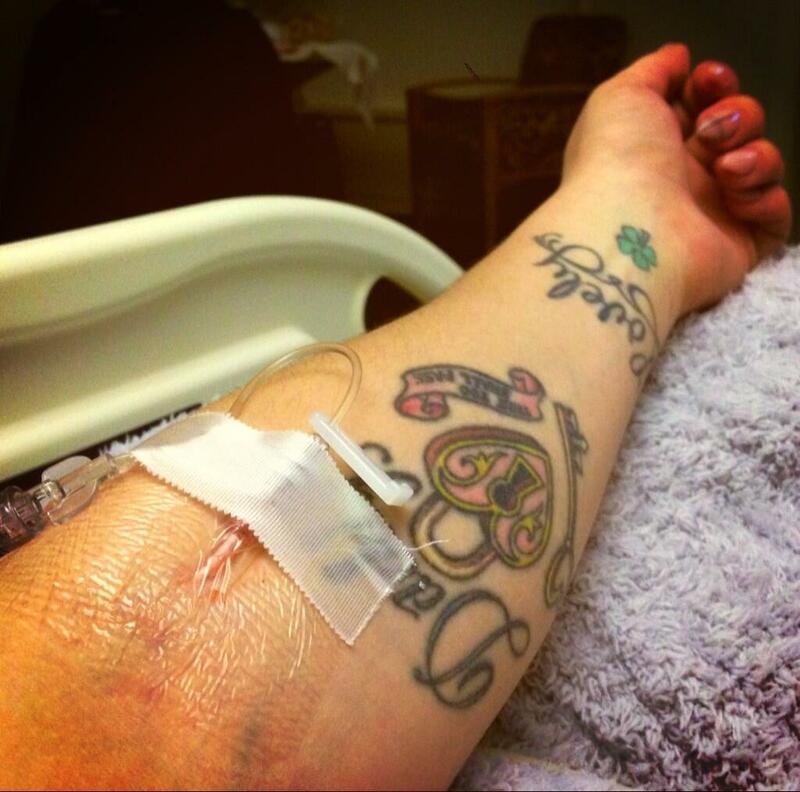 She tweeted a picture of herself (and her manicured nails) attached to an IV drip in the hospital. She was apparently suffering from exhaustion and dehydration. Rih-Rih didn’t give details about where she was when this picture was taken, but she was spotted in LA just a few days after this. 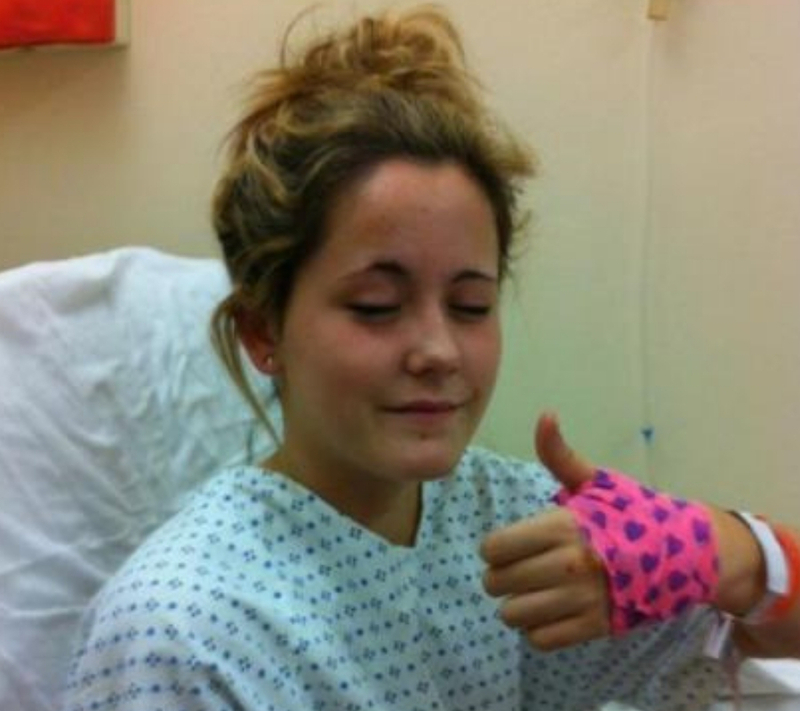 Jenelle Evans from Teen Mom and Teen Mom 2 had to undergo emergency surgery in late 2018 after going in for a routine procedure. She was originally supposed to get her sinuses drained but ended up having to do a much more invasive procedure. 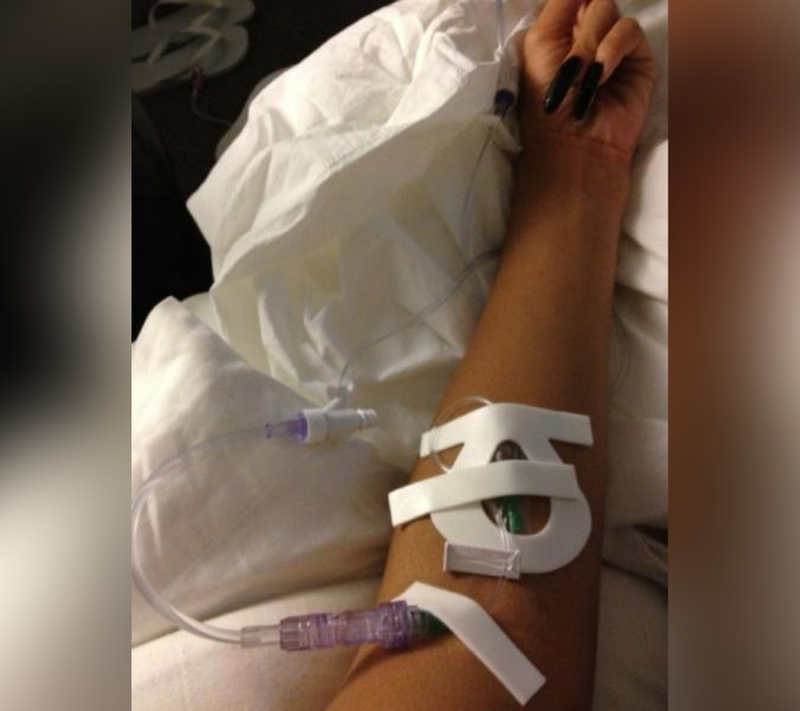 She posted many pictures to social media saying that she’s feeling awful and that the procedure was much tougher than expected. Hopefully, for Jenelle, this is the last medical procedure she has to endure so she can focus on taking care of her kids. 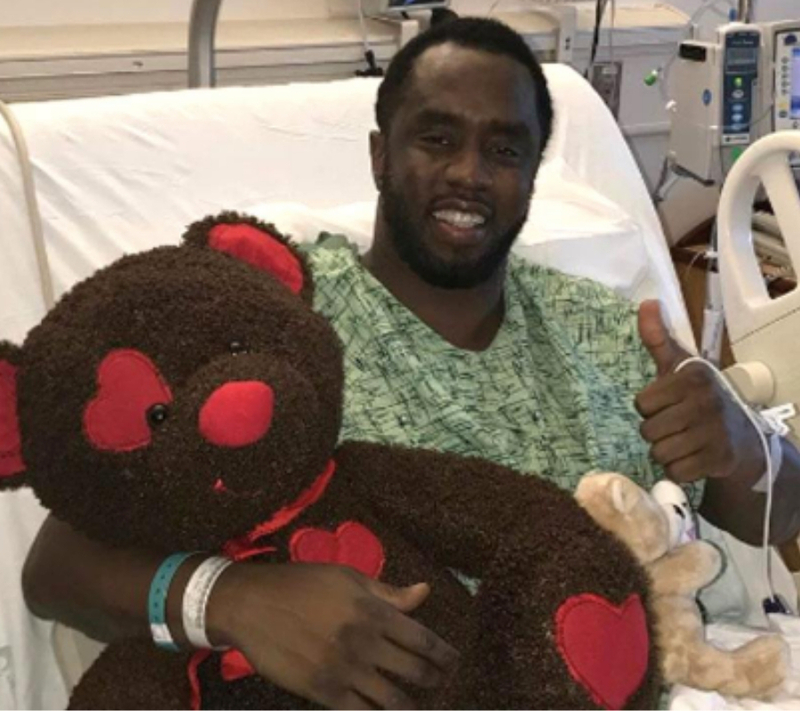 Puff Daddy, Puffy, P-Diddy, Diddy and every other nickname he has, snapped a picture from his hospital bed in early 2017. He revealed that he had undergone his third and final knee surgery in under a year. Doctors told him that he’d probably never be able to run again, but that news only inspired him to work even harder on rehabilitating his knees. Diddy had one of the cutest cuddling companions along the way too. Just ahead, Kathy Griffin and her “dental work” will probably make you laugh. 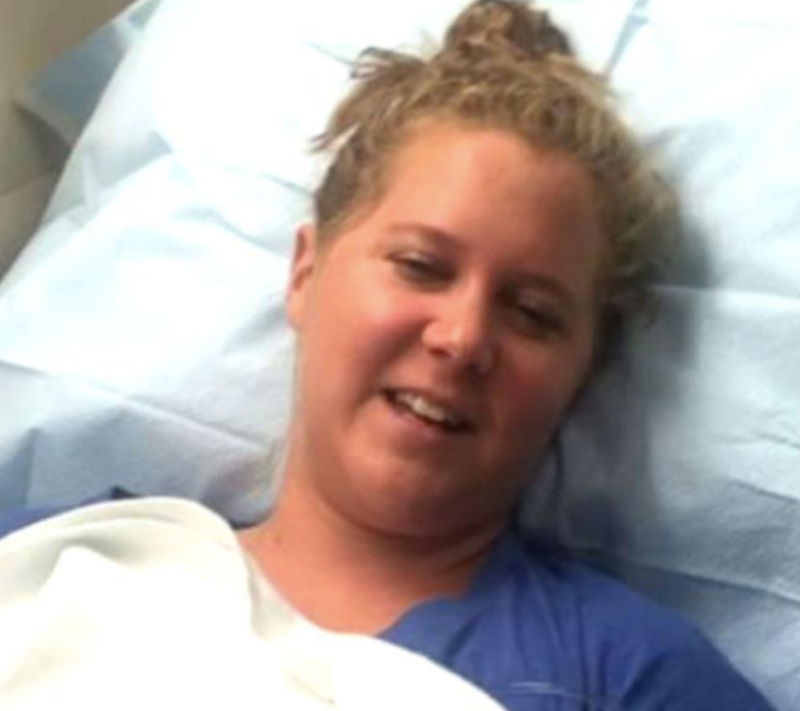 Comedian Amy Schumer shared a picture of herself in a Paris hospital after getting a horrible case of food poisoning. What was supposed to be a romantic getaway with her boyfriend turned into both of them getting poisoned by some raw seafood. She shared hilarious stories on The Ellen Show about how she had to share one hotel bathroom with her sick (new) boyfriend. If they didn’t know each other before this trip, they sure did afterward. 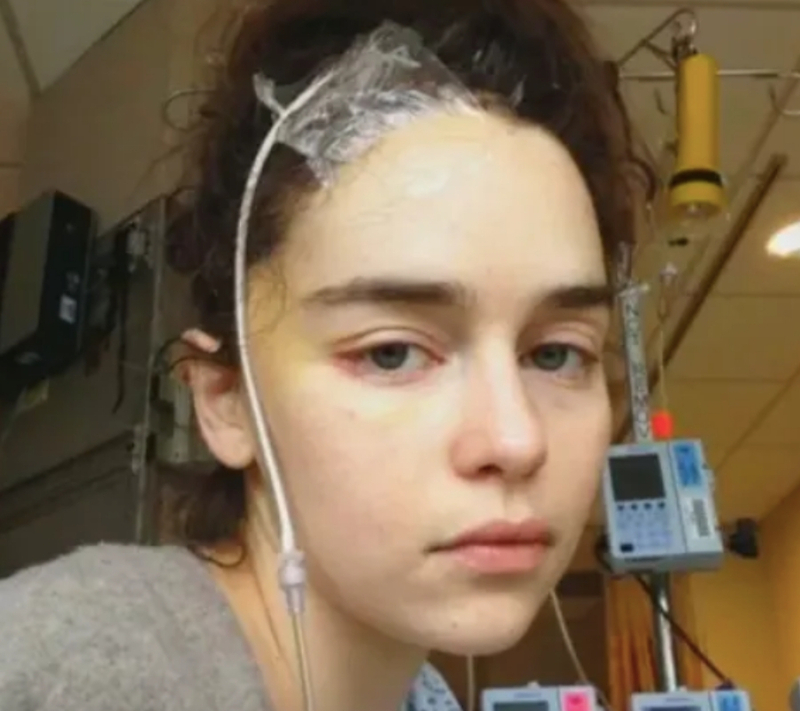 In 2011, Game of Thrones actress Emilia Clarke was rushed to the hospital after suffering a stroke. Early in 2019 was the first time that she shared some pictures from the hospital during that scary time. As soon as she was released from the hospital, she said that she felt perpetual fear that she was going to die any second. She went on to endure another aneurysm two years later and was forced to battle through that too. She hasn’t had to deal with any more complications in recent years and is optimistic about her future health. Kathy Griffin has been VERY open about the “dental work” she’s had done on her face. The term “dental work” is in reference to plastic surgery which she credits to boosting her confidence and making her a lot happier. She snapped this picture of herself getting actual dental work done in order to prepare herself for hosting Fashion Police. She joked that she was actually seeing a dentist this time and it wasn’t the fake “dental work” that she always gets. Singer Lily Allen was on a talk show just hours before being admitted to hospital. Her story is coming up. The last place Chrissy Teigen thought she was going to end up when she took the gig to help host Lip Sync Battle was in the hospital. But, that’s exactly what happened. 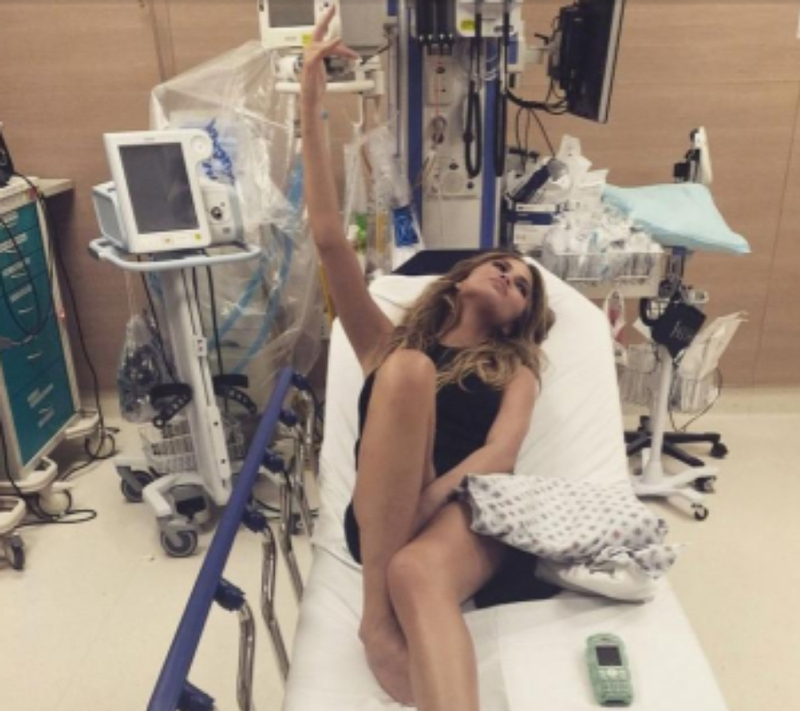 The model found herself on a gurney after breaking her foot while filming the show that’s literally about celebrities lip syncing. Teigen managed to look like she was relaxing on a beach chair instead of a hospital bed, but we really wouldn’t expect anything less from her. 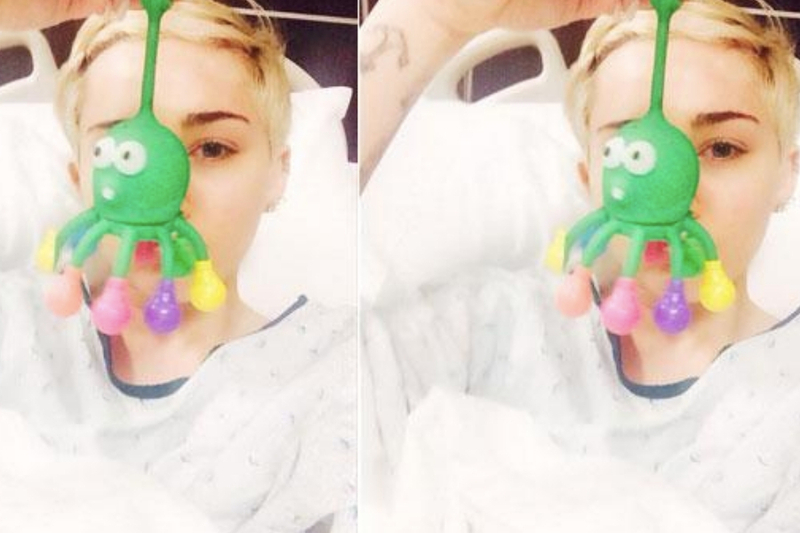 Once she entered the hospital, she shared a picture to her social media saying that her octopus and the amazing doctors were taking great care of her. She ended up having to cancel her St. Louis show as well. Lily Allen was hospitalized in 2018 after she came down with a really nasty flu bug. 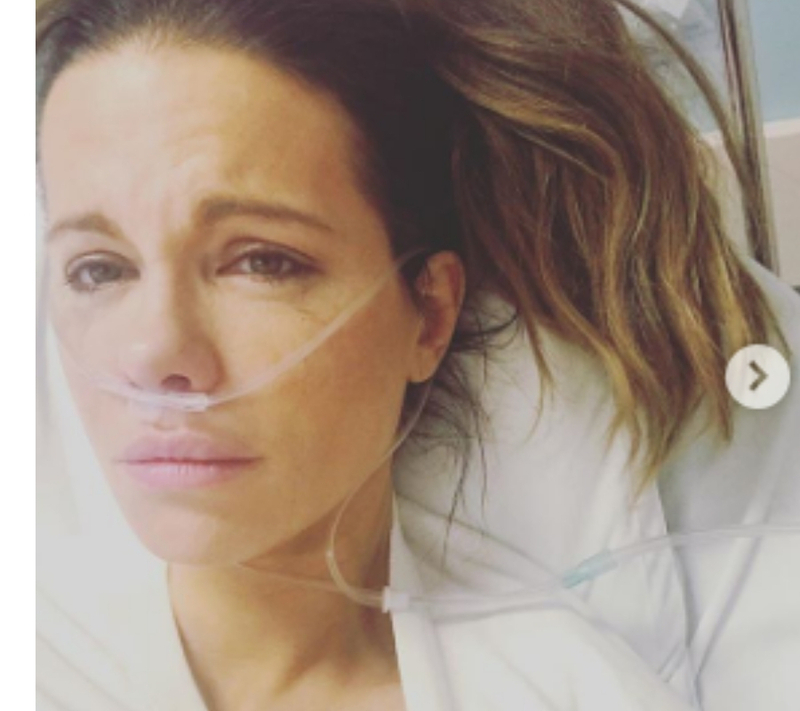 She took to Instagram to let her fans know that she’s okay, but that she couldn’t keep anything down which is why she ended up going to the hospital. She had attended the Met Gala a couple of days before she fell sick. Not only that, she was a guest on the popular talk show Alan Carr: Chatty Man just hours before finding herself in the hospital. 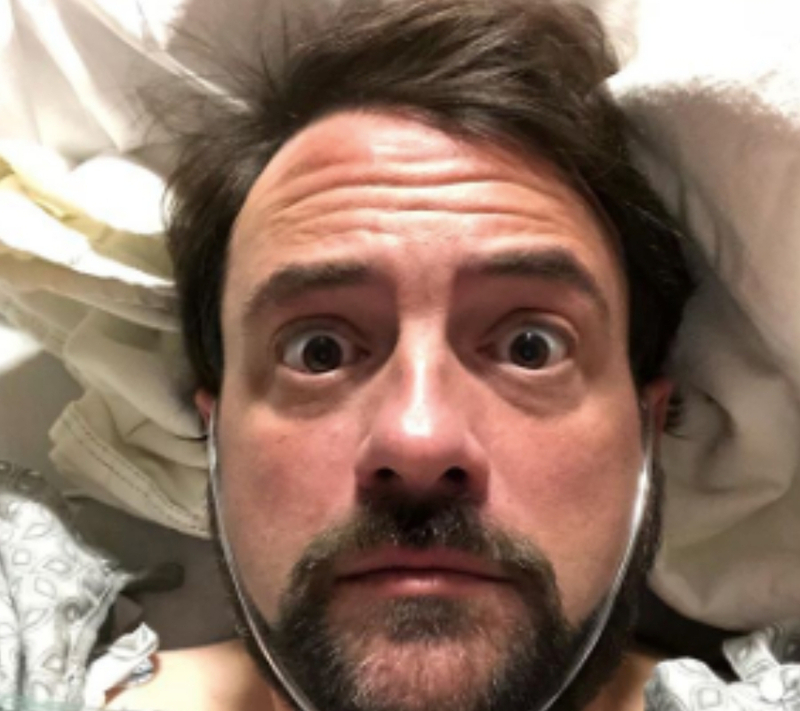 Kevin Smith took to his Instagram page shortly after having a massive heart attack. The 47-year-old snapped a selfie from his hospital bed, showing the many tubes and wires that were making sure he was in stable condition. The doctor told him that he had 100% blockage of his LAD artery (also known as the Widow-Maker). Smith canceled two of his shows because of chest pain, and if he didn’t he probably would’ve been dead. But, he’s made a full recovery and is still creating hilarious content. 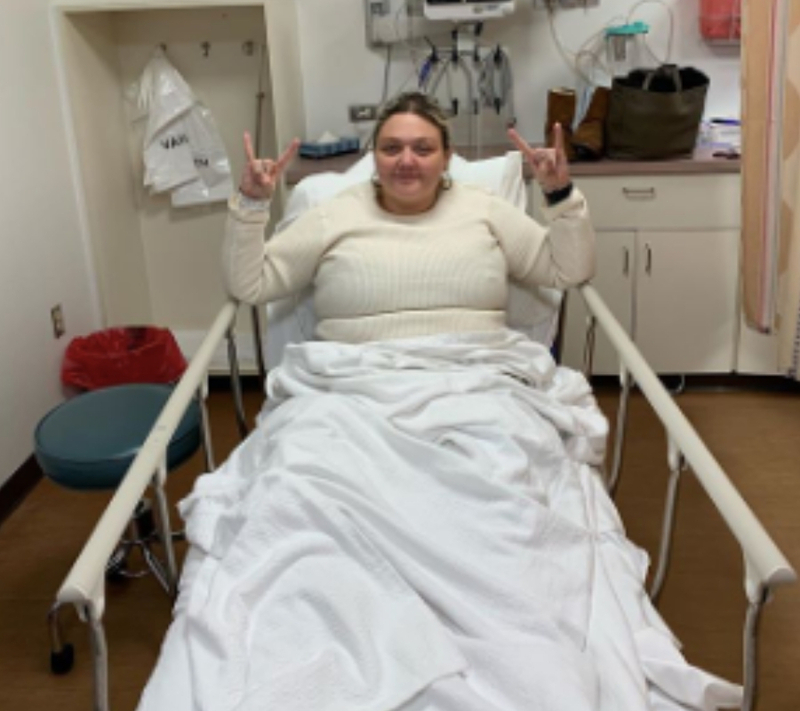 See a picture of singer Elle King just moments after getting into a brutal skiing accident. Busy Phillipps Had Shards Of Glass In Her Eye? It turned out that she had Photo Keratitis from bright lights and sun exposure. Who even knew that was a thing? As you can see, she was struggling pretty bad, but has since been killing it with her new talk show. 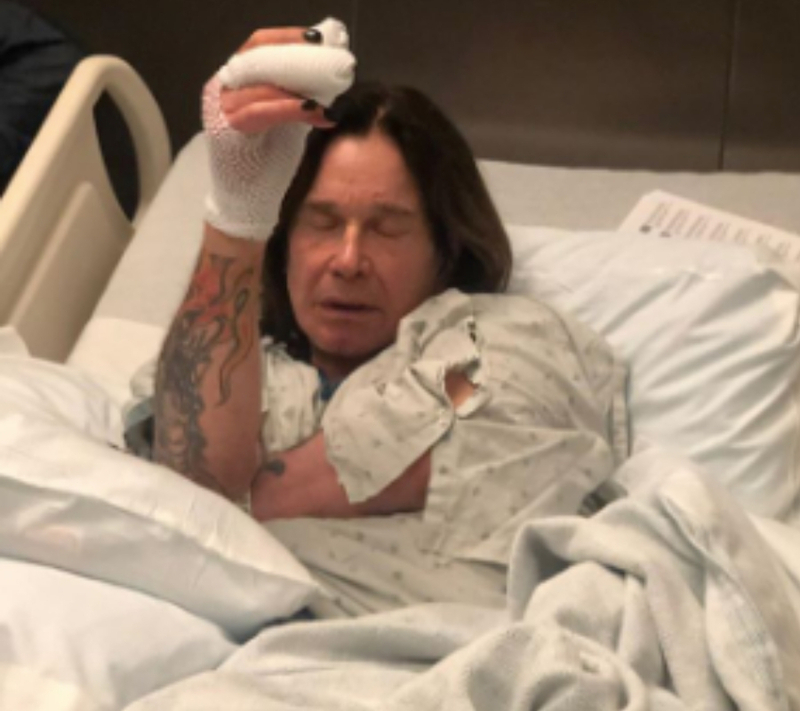 The Black Sabbath frontman and legendary rocker took to Instagram on Oct. 8th, 2018 to show a photo of himself in the hospital. He had an infection in his hand which gave him a lot of pain and he ended up requiring surgery. The singer had to postpone his sold-out show in California because of the infection. He ended up having to stay in the hospital for longer than expected. Elle King is just like the rest of us non-athletic people who try to ski or snowboard and fail miserably. 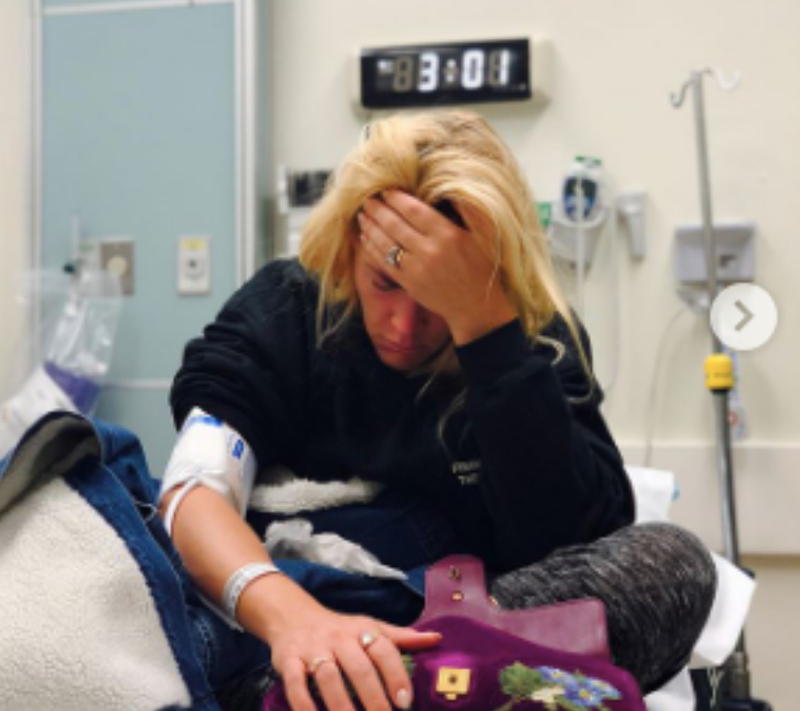 She had a major accident at the Beaver Creek Mountain in Colorado on Jan. 19th, 2019, and Instagrammed a picture from her bed. She said that she felt like she went from 0-80 in half a second and fell on her knee. They ended up closing the run down because there were a bunch of people getting hurt on it. While they can be generally harmless, once ruptured, they can cause some serious symptoms. Kate said that her mom took the picture and that she wouldn’t have posted it, but someone took a picture of her in a wheelchair outside of the hospital so she wanted to set the record straight. 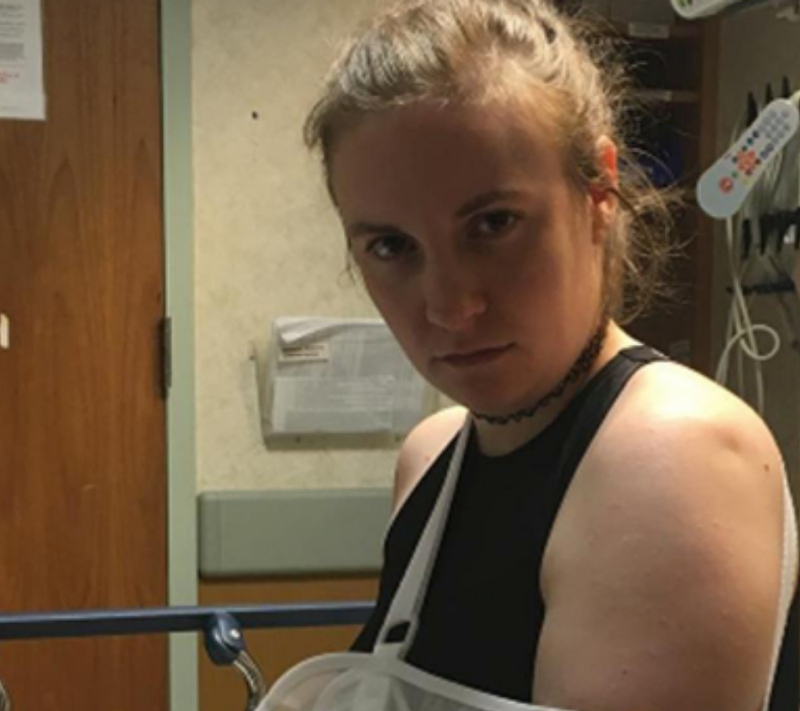 The star of the hit show Girls, Lena Dunham, took a picture of herself sitting on a hospital bed with her arms wrapped in a sling on July 15th, 2016. According to her Instagram caption, she got injured while trying to do one of her own stunts on set. She followed this picture up with another one by saying that the real reason she’s in a cast is that she tripped over her flip flop. After staying the night in the hospital and getting X-rays done, she determined it was just a sprain.